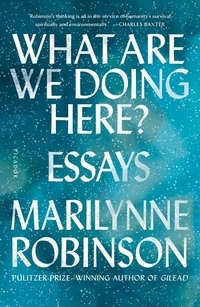 Marilynne Robinson has plumbed the human spirit in her renowned novels, including Lila, winner of the National Book Critics Circle Award, and Gilead, winner of the Pulitzer Prize and the National Book Critics Circle Award. In this new essay collection she trains her incisive mind on our modern political climate and the mysteries of faith. Whether she is investigating how the work of great thinkers about America like Emerson and Tocqueville inform our political consciousness or discussing the way that beauty informs and disciplines daily life, Robinson's peerless prose and boundless humanity are on full display. What Are We Doing Here? is a call for Americans to continue the tradition of those great thinkers and to remake American political and cultural life as "deeply impressed by obligation [and as] a great theater of heroic generosity, which, despite all, is sometimes palpable still."